Issue #243 • July 19, 2018•Buy Now! I got a job at Louisville Sausage the fall after I’d been let go from my position as a railway engineer. They’d fired me in May, and I’d spent the summer trying to find a new engineer position in the mornings, drinking at Hank’s in the afternoons, and at night watching the presidential primaries and calculating how long it would take for my savings to sift through my fingers. I had child support payments on top of my own expenses, and I liked to treat my favorite bartender, Cynthia, to dinner now and then. Carlos, a regular at Hank’s, introduced me to Luke, the owner of Louisville Sausage, and since the shop was constantly understaffed, Luke hired me on the spot. I earned less than half what I had as an engineer, but it was still a couple dollars over minimum wage. I didn’t mind the pay cut because it was temporary: my license wouldn’t expire for another three years, and when we elected a Republican president who would push for more gas and oil extraction, railway jobs would once again start to flow. Rachel King was educated at the University of Oregon and West Virginia University. Her fiction has appeared in Flyway, the Concho River Review, the Farallon Review, Ashland Creek Press’ Among Animals 2 anthology, and the Museum of Americana, where it was nominated for Best of the Net. Her poetry chapbook Between Work and Light is forthcoming from Dancing Girl Press. She lives in her hometown, Portland, Oregon. RK: My husband used to work at a sausage factory. One of his coworkers had run over a guy when he worked as a train engineer, and I wondered whether he felt guilty about it. PR: Not to make any assumptions about the way you voted in the last presidential election, but what was it like to get inside the head of a someone who supported the person who currently occupies the presidency? RK: I honestly didn’t think about it until someone pointed it out. To me, it was very matter-of-fact reasoning: this guy supports the Republican candidate because he hopes his policies will help him get his job back, and since Republicans are known to be more pro—extractive industry than Democrats, this hope seems plausible. Exploring different kinds of characters’ stories is one of the main reasons I wanted to be a writer, and when a character comes to me, I go with it. Once someone pointed it out, however, I became worried that readers might interpret the story as some kind of ambitious archetypal portrayal of a “Trump voter” instead of a story about a specific person in a specific situation. I just finished In a Lonely Place by Dorothy Hughes, and I’ve been thinking about how when it came out I bet some readers were probably upset that her serial killer narrator had such a sympathetic voice, while others were probably pleased that her female characters overturned detective novel stereotypes. Or take one of my favorite novels, Sometimes a Great Notion by Ken Kesey. Is it pro-union or anti-union? Does it celebrate toxic versions of masculinity or explore a woman becoming empowered? These are fine questions to discuss, but I love it because it was the first book I read where the landscape and people of the Northwest felt real to me—like some of the places and people I’d known growing up. As a writer, I’m exploring the stories of characters I’m obsessed with, and my goal is to make their lives feel real to the reader. I hope “Railing” accomplishes that. If readers want to view it from a political angle, they are welcome to do so. The story belongs to them now. 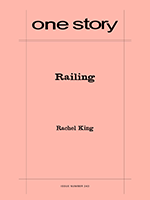 PR: How different is “Railing” from the story you first envisioned? RK: I didn’t envision too much at first; I was just following the narrator’s voice. Usually, by the time I begin a story, I won’t know all of the plot points, but I will have an idea of a structure that I’m aiming toward. Challenging myself by experimenting with structure is very important to me and one of my greatest joys in writing. But maybe because this was one of the first stories I attempted after revising a novel, and I was tired of parsing each choice, I deliberately decided to press on after I heard that first sentence without any overarching structural ideas. As far as major changes after the first draft, I cut down on the number of characters (yes, there used to be even more!) and on the length of scenes, and I deepened the narrator’s relationship with Laura. PR: What was the biggest challenge in bringing the story onto the page? Or what was the biggest surprise? RK: The biggest surprise was that the story wasn’t primarily about what I thought it would be about (an exploration of guilt). The most challenging part was using that knowledge to deepen the story. PR: When you envision your narrator today, in the summer of 2018, is he still glad to have voted the way he did? Still just as sure things are going to get better for him? RK: I’ve never imagined what happens to one of my characters after a story ends, but I will try. The narrator probably found a railway engineer job again. He likes that work and earns decent money, so he’s happy with that. He probably misses some of his friends from the factory, and he’s also sad that his time with Laura is more erratic, since train engineers are on-call 24/7. He’s probably been researching Trump’s tariffs recently and wondering how they’ll effect the American oil and gas industry. So I think he’s in a better place financially. He’s inherently an optimist, so yeah, he thinks things will get better for him. I think the kid’s death still bothers him, but not as much. I hope he’s made Laura his first priority, but maybe not. As for his vote, I doubt he thinks about it with either regret or pride; I doubt he thinks about it much at all. He voted for Trump in the general but not the primary (unlike Matt, who voted for him in both), and I could see the narrator sometimes thinking Trump’s an idiot, maybe even enough of one for him to opt out of voting in the next presidential election. I don’t know. RK: In general, I’m writing stories about other characters in the factory/adjacent to it. This weekend, I’m trying to revise one from Carlos’s girlfriend’s perspective. I’m also searching for representation for a novel I’ve written about characters working for or against the Beach Bill, a 1967 legislation that made all Oregon beaches public land. RK: Here’s two: The poet and my former instructor Mary Ann Samyn has said, “Write everything you see and everything you don’t,” advice which helps me when drafting. And I read or heard somewhere that if your trusted reader tells you where to revise, they’re probably right, but if they tell you exactly how to revise, they’re probably wrong—and in general, I think that’s true.